For kobolds in the service of King Torg (all hail King Torg!) life will undoubtedly be silly, brutal, and short. They may be crushed by cows falling from the sky. They may be obliterated by meteorites, betrayed by friends, or brained by frying pans. They may cheerily march to their death upon the beaks of chickens or from the tentacles of eldritch magicks. If they are really lucky, they may survive long enough to bring back a tasty treat to the kobold caves and avoid becoming lunch themselves. 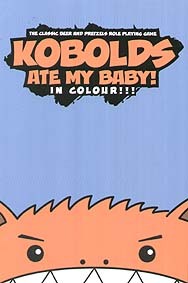 In Kobolds Ate My Baby! You are a kobold! Being cannon fodder has never been this much fun! The classic game of beer & pretzels roleplaying returns in this definitive, full colour edition. This book includes everything you need to play except some dice, some friends, and a wicked sense of humour.